The Crazy Quilt details series of articles each highlight the hand embroidered seams and embellishments on the blocks that make up my crazy quilt I dropped the button box. 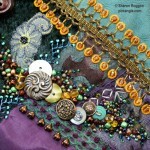 I hope the eye candy and details give you ideas fro your own crazy quilting projects. For a free pattern of the block and information about the fabrics I used when I made up the block click on the block thumbnail. 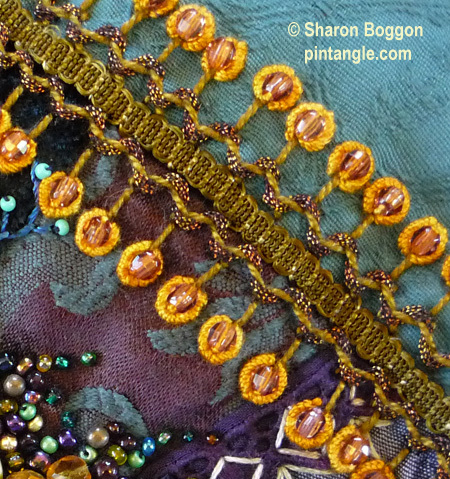 This seam embellishment started with a small thin commercial braid that I attached to the block. Using perle cotton #5 , I worked a row of Herringbone Cretan stitch each side of the braid. I then laced it with a metallic thread, adding beads before surround them with a long bullion knot of about 25 wraps. The thread I used for them is cotton perle #5. Each block on this quilt has a free pattern. Links to these free pattern pages are listed on the CQ details FAQ page. Those bullion knot circles are fabulous! Wonderful rich interplay of metallics, with only two iridescent elements to highlight the sheen of perles! Marvelous bullions, making halos of bright gold around each crystal bead, complementing the green-golden quality of the braid and border of laced stitch work!